Many companies are working on leveraging the blockchain to solve digital advertising industry problems. I've been trying to keep track of who's doing what and how it all fits together. 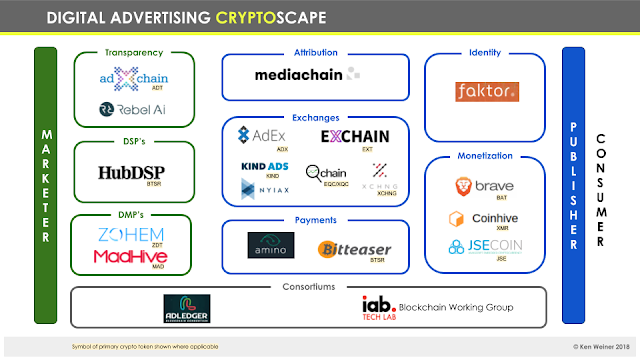 Inspired by the famous Display LUMAscape from LUMA Partners, I've come up with the following Digital Advertising Cryptoscape! Open protocol on the public Ethereum blockchain that allows for the building of decentralized applications for the $175 billion digital advertising ecosystem. By MetaX. adToken (ADT) is a multi-purpose token with usage properties for voting, depositing and challenging entry into the adChain Registry. Blockchain-enabled ad security solution that protects publisher identity and advertiser spend, and prevents ads from ever appearing on an unauthorized site. Accepts BTSR (10% off) and other cryptocurrencies. Audience-Driven Data Solutions for OTT and AdvancedTV. Founding member of adledger. Mediachain is a blockchain data solution for connecting applications to media and information about it. 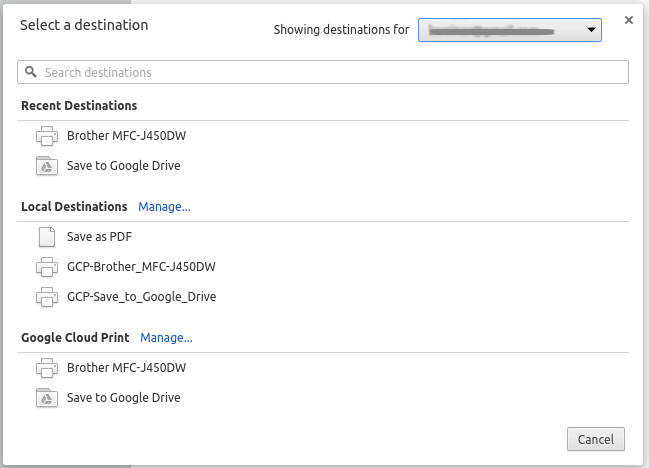 Attribution Engine. The best image search engine for creators. Find free, high quality images that you can share and re-use. A decentralized ad exchange built on top of Ethereum smart contracts. Blockchain and programmatic advertising platform by EnvisionX. Formerly Bitcasts. A Decentralized Trust Protocol (the “Kind Ads Protocol”) will create an ecosystem for users, publishers, advertisers, and app partners. Currently focused on push notifications and developing a quality and reputation score for domains. No fees will be charged on dollars spent. The world's first exchange to trade advertising contracts. Developed in partnership with Nasdaq, NYIAX combines financial trading and advertising technology in one platform to enable publishers and advertisers to buy, sell, and re-trade premium advertising inventory. As the first and only trusted, transparent, future inventory marketplace, NYIAX allows both publishers and advertisers to increase ROI and reduce costs. By Kochava. Through a smart contract IO, enables the related targeting and activation of audiences, and bolsters ad-spend efficiency and security. It will usher in a next-generation advertising system of record for all participants. Transparency-focused ad tech payment tech. Use coin BTSR as a form of payment when the bill needs to be paid for programmatic advertising worldwide. A blockchain based Identity Management platform for publishers, safely connecting people to brands and content. A Chrome-based browser that blocks ads and uses Basic Attention Token (BAT) to pay users and publishers. Allows publishers to mine Monero (XMR) in users' browsers. A brand new coin specifically for publishers to mine in their users' browsers. Nonprofit research and development consortium charged with implementing global technical standards and solutions for the digital media and blockchain industries. Investigates the application of blockchain technology to address challenges in the digital advertising space and to develop standards and best practices for the utilization of blockchain technology. If you are aware of any additional organizations using the blockchain for digital advertising that belong on this cryptoscape, please leave a comment, and I will update it. This year I finally cut the cord and got rid of my DISH satellite TV service which saves me about $50 per month! I've had the service for many years just to get the basic local channels like CBS, ABC, NBC, and FOX. My plan was to replace DISH with a digital antenna so I could get all of those channels for free. In this post, I'll share the model of the antenna that worked for me here on the west side of Los Angeles. Finding the right antenna proved to be more difficult that I thought it would be. I first started with an indoor VHF/UHF antenna, the NorthVu NV20 Pro AMPd, that I got from Tablo's website. Tablo is an Over the Air (OTA) DVR company. Long term, I was contemplating buying one of their DVR's so I figured it would be good to get an antenna they were familiar with. With this antenna, I was able to get some UHF channels like CBS, but none of the VHF channels like FOX. I thought that maybe an indoor antenna was not powerful enough for my neighborhood in Los Angeles which is Del Rey 90066. I shopped on Amazon for a highly-rated outdoor roof antenna and purchased this 1byone 85 Miles VHF/UHF antenna. I borrowed a friend's ladder, got on my roof, mounted this antenna and connected it to the coax cable that was previously connected to my DISH satellite which DISH never came to retrieve. I also plugged in and connected the included power booster behind my TV. Unfortunately, I got the same result: UHF channels came in perfectly and VHF channels did not work at all. I have no idea why since the specs for this antenna clearly claim that both VHF and UHF should work. I ended up returning this antenna to Amazon for a refund. Note: Some Los Angeles area residents have reported problems receiving KABC 7.1 ABC, KTTV 11.1 FOX, KCOP 13.1 MYTV and KCAL 9.1 IND when using antennas other than the EZ HD or the HD Stacker. This is due to the VHF broadcast signal frequencies in use by these stations and the use of the improper antenna to receive VHF signal frequency. Many of today's antennas (do to smaller antenna size) will not receive VHF signals. The EZ HD and the HD Stacker are designed to provide excellent performance across the entire VHF/UHF frequency spectrum in use in the Los Angeles free to air broadcasting market. So I immediately ordered their EZ HD antenna. It arrived at my house in just a few days. I mounted it on my roof, connected the coax cable, connected a ground wire that was also left over from the previous DISH satellite, and scanned for channels on my TV. Amazingly, it worked! I was able to receive all the local channels, both UHF and VHF. I have no idea why this antenna worked so well. To be honest, this one felt flimsy and cheaply made compared to the one I bought on Amazon. A list of local channels is easily available online, but I wanted one for my phone so I downloaded the app TV Listings by TV24. I was amazed how many channels you can get for free over the air. The TV Listings listings were pretty accurate. I look forward to being able to watch local news once in a while or a live event like the Grammy's that is hard to find online. The next thing I am going to look into is whether I want to purchase a DVR such as Tablo. A lot of the shows I've been watching are on Hulu, Netflix, and Amazon to which I already subscribe. It isn't clear yet whether the DVR is necessary.